I was interested to read Mrs. Leader's note on the Croxley of days gone by. Having been born twelve years earlier, perhaps I can add one or two further items of interest. I was born in one of eight houses in the New Road known as Louise Gardens; when the road was numbered our house became 104.The first butchers I remember in New Road were Mr. Jackson and Mr. Ernest Wilbee. Both these had their own slaughter house at the rear of their shop. Ernest Wilbee's shop was at the end of four attached premises and at the other end was a grocers kept by Mr. Arthur Wilbee. In between were two private houses set 3 or 4 feet back from the line of the shops. Arthur Wilbee ran a cycle repair business in his back yard. Mr. Saunders, the butcher, who had for some time worked for Mr. Jackson, started his own business in a shop previously run as a fishmongers by Mr. Garland, who had moved to a doublefronted building he had built almost opposite. In his new shop he sold fish and vegetables. The store Mr. Dimmock ran for some years was originally owned by Mr. Flack and managed by Mr. Wells who, after a time, moved a little higher up the road to start on his own in a shop kept by Mr. Ranee for the sale of furniture. Mr. Rance kept a few cows which he grazed in two fields on one of which Dickinson Avenue was built. The either was on the New Road / Yorke Road corner before there were any houses from the blacksmiths premises in the New Road to the two houses next to the school in Yorke Road. 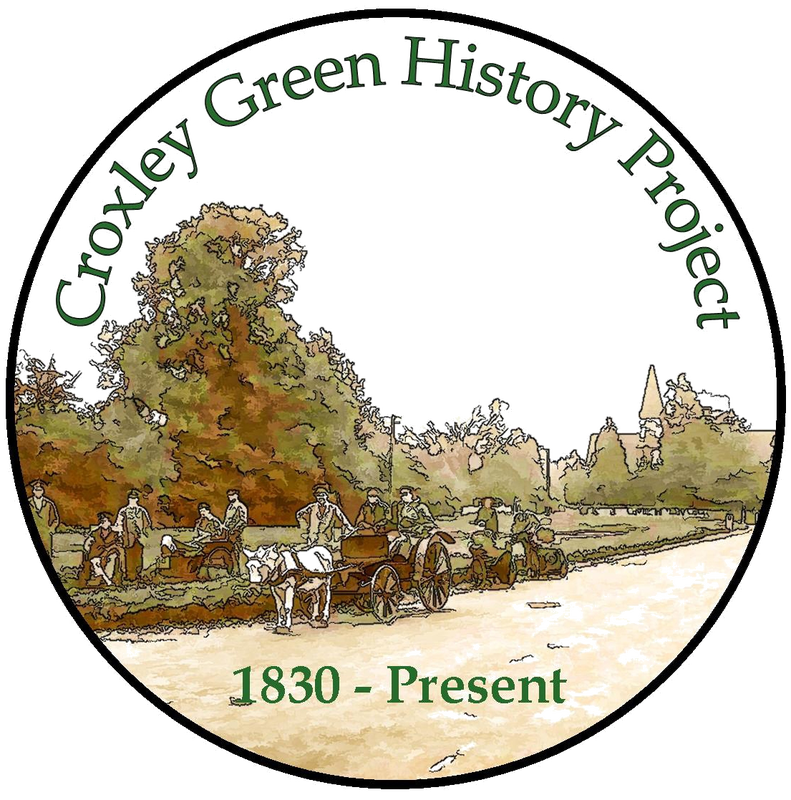 When the Croxley Co-operative Society was first formed they opened a shop in a private house, No. 5 Dickinson Square. After a time they took over a shop in the New Road which had belonged to an old gentleman named Mr. Hearne. They ran this for some years but it was an old building and needed much in the way of repair. They decided to replace it and it was taken down, the present grocery building being erected in its place. Near the bottom of the New Road was a sweetstuff shop kept by Mrs. Barnes and we youngsters, after we had been swimming in the canal, would sometimes, in the summer, if we were in funds call at her shop and invest half our penny a week pocket money on such favourites as gob-stoppers and kalibonkers. When the street lamps were first brought to the village they were of the flame gas type and a lamp-lighter came round carrying a long pole, at the top of which was a perforated metal container and in this container was a lighted wick. With the end of the pole he would push over the lever to turn on the gas and light it from the wick. Where Winton Crescent and Winton Drive now stand were several small holdings. On one Mr. Darrah kept a few pigs and on another Mr. Drury grew an evergreen shrub, used mostly for flower arrangements and wreaths. Other holdings were used to grow vegetables. 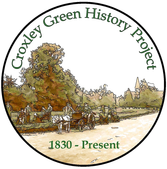 The small holdings Society also rented from the County a meadow on the Sarratt Road and known as 2nd Clobbs. This was let to Mr. Sears, a farmer who lived at Lovatts Farm on the green. Mr. Sears sisters kept a grocers shop at Scotts Hill also in that area where Mr .. Mitchell the barber, Mr. Tomkins the butcher, Mr. Mason the grocer, as well as Mr. Dorrell the baker, famous for his pork pies. In the winter, Mr. Dorrell would sometimes send his pies hot round the village for sale. Another welcome visitor to the village was the Muffin man. He would come along with his wares, covered with a thick cloth, piled on a board which he carried on the top of his head. His head was in a pad fastened to the 'underside of the board. As he walked he rang a hand bell and called out "MUFFINS 'N CRUMPETS". We would sometimes watch the blacksmiths putting new steel tyres on to cart wheels. The tyres which had been made to fit their particular wheels, were heated in a large bonfire. This was to increase the circumference. Nearby was a large iron pad which had a hole in the centre. This hole was to take the hub so that when a wheel was laid on the pad, the rim would rest on the iron. A heated tyre would be brought from the fire and placed round the wheel. It was immediately cooled with buckets of water which would shrink the tyre tight onto the wheel. Of the Churches, All Saints was there before my time. The Methodist Church was built the same year in which I was born, viz, 1892, and the Gospel Hall a few years later. This, together with two or three houses on either side was destroyed by a German landmine in 1944. When it was possible to recommence building after the war, a new Hall was built in Fuller Way. One of my memories of the Boer War is of the rejoicing at the news of the relief of Mafekin. There was a torchlight procession in the New Road, by the light of which two name places were fixed, one at either end of a row of houses belonging to Dickinson's, and the name? MAFEKIN TERRACE.